Every origin Original Beans create has its own distinct color scheme. 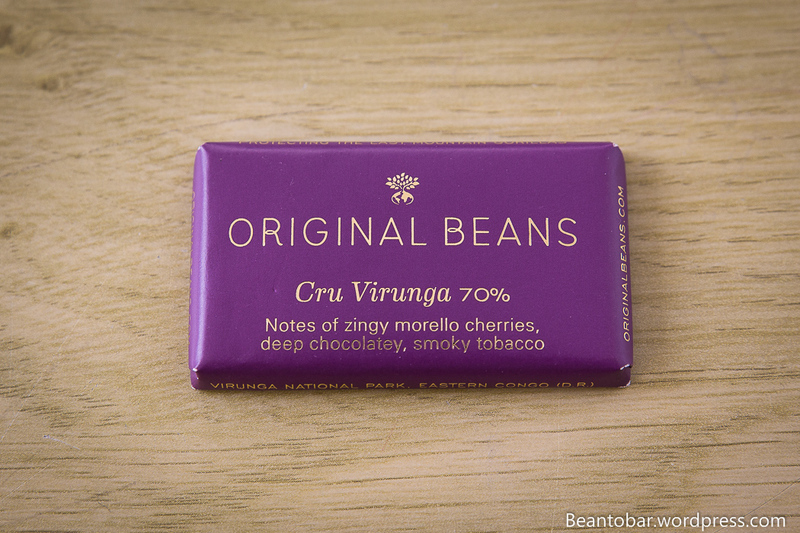 The Cru Virunga is hidden in a deep purple wrapper with golden label and writing. It’s a one portion size and is just perfect for a little nibble. African cacao is rare in fine chocolate. After all, most industrial chocolate bars are made of high yield, less tasteful Forastero beans grown in this region. 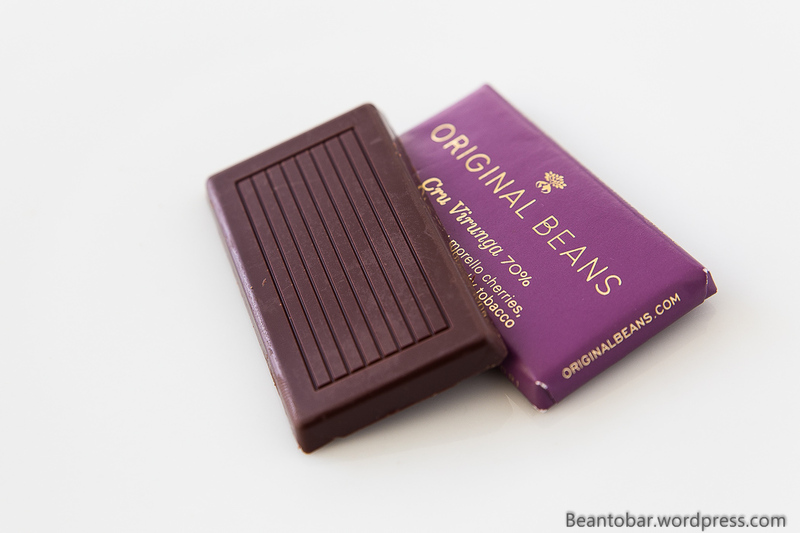 Orginal Beans however, search the best and rare cacao in the eastern part of Congo, grown in the Virunga national park, and create a great looking dark chocolate with it. Color: Deep brown nearing purple – somehow the color reflects the wrapper. Or is it the other way around? Aroma: woody, punchy and powerful. Taste: The chocolate start of soft and sweet before suddenly picking up pace and thunder down on the palate with lots of dark chocolate and underneath a nice dark rich cherry tone, mingled with smoky notes. The cherry flavor goes back and forth in waves and seems to battle the wood aroma’s to get all your attention. The texture and melt are heavenly. Melting easily and incredibly velvety. Just the right amount of dark espresso tones make this a very mature and satisfying chocolate. Powerful, without being overwhelming. Too soon the chocolate is gone, but next comes the aftertaste. Starting very smokey, it gives way to more cherry aroma before it starts rolling over and back once more. If there had to describe the taste of this bar it would be: cherry-chocolate-wood waltz. It just keeps on going and going! Devine! And the funny part is… I really didn’t have to write this review. Original Beans just nails the flavor profile on the wrapper itself! Notes of zingy morello cherries, deep chocolatey and smoky tobacco… I can’t say it any better myself! Cherry and tobacco notes sound superb. I love when emotive language is used in describing chocolate, it’s so teasing!